With the mission and vision in mind, we went back and forth trying to churn out a logo concept that is different from the usual NGO’s designs. After numerous brainstorming sessions, we came up with the “string” concept. How this “string” concept came about was mainly centred on getting people together, to bring humanity beyond. This simple item might seem insignificant and fragile, but it is always used to bind and secure individual pieces together. Like humanity, a small and simple deed can go a long way, stringing together a bigger picture for a better world. 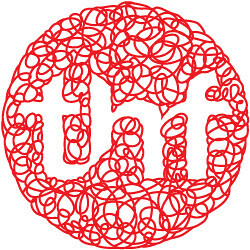 THF is a group of volunteers from different walks of life, coming together with a common mission and vision in mind, thus the creation of the ball of string with THF being the centre of it. This ball of string is the connecting point for THF to extend our help to those in need. It is similar to knitting, we would say. It starts from a ball of string and with the versatility of this single string, we’re able to knit into a pair of mittens, a piece of scarf, a pullover and the likes. From this, we are able to provide the gift of warmth for the less fortunate – like how a mother will embrace and protect her child with warmth. With this concept, we can expand further by using this “string” as our main linkage that ties everything together to our different humanitarian activities like Health, Infrastructure, Education and Livelihood.